Seattle proudly claims to be the city which has the most coffee shops of any city in America, and you’ll quickly discover the coffee here is more than just a drink - it’s part of the local culture. So experience the coffeehouse culture of Seattle and discover just how passionate locals and baristas are about what’s in their cup! Whether the weather is drizzly or the sun is shining, enjoy your day sipping three unique brews at different cafes, coffee shops and roasteries as you learn about the process that goes into roasting the coffee beans and creating a perfectly balanced blend. 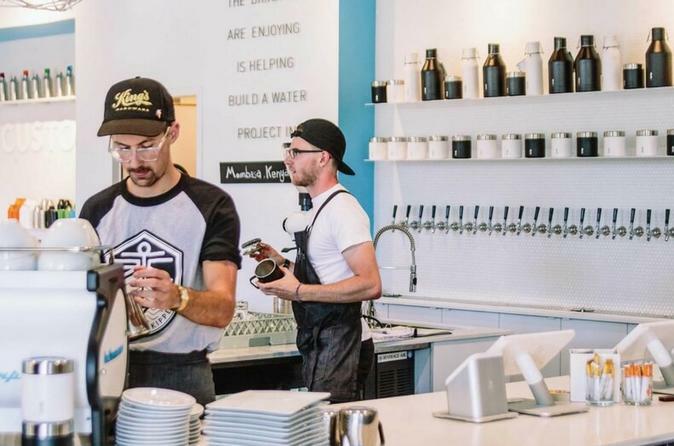 Discover trendy brews and the coffee shops that locals really love, as well as trying your hand at being a barista at the La Marzocco Espresso Lab. Let a local share with you the coffee house culture of Seattle as you go on a journey through the coffee shops, bookshop cafes, roasteries and coffee labs of the city. You’ll be able to try three different, and totally unique coffees throughout your experience, discovering the differences between trade, single origin and blend varieties, as well as the process of roasting the beans. Discover the overwhelming choice of brews that are made by passionate baristas here in Seattle! From pour-overs to cold brews that are soaked for 12 hours, deeply rich espresso loved by purists to velvety smooth flat whites, you’ll be able to try a variety of coffees and choose your favourite! Learn a little about the origin of the beans in each cup, and how where they come from can affect the taste! As well as discovering the process behind your delicious coffees, try your hand at being a barista as you pull your own shot at the La Marzocco Espresso Lab at the Seattle Center. You could visit the original Starbucks Cafe in Pike Place Market, head to Seattle Coffee Centre for a ‘cupping lesson’ or simply savour the coffee house culture like the locals do as you stroll through the city, stopping by bookstores and coffee houses to get a real taste of the local culture!